With 100 or more pets visiting every day, Dr. Adam Conroy and his team at Animal Care Clinic veterinary care center were facing some serious air quality control issues. In addition to an ongoing odor problem, the team was concerned that sick animals could spread airborne pathogens throughout the facility. 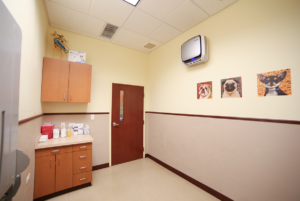 By installing AeraMax Professional commercial grade air purifiers, Animal Care Clinic effectively addressed concerns about the flu virus and other airborne pathogens while providing clean air for patrons. AeraMax Professional removes 99.9 percent of contagious particles from the air, so that the chances of them being inhaled or contaminating a surface are greatly reduced. What’s more, as the first commercial-grade air purifier Certified asthma and allergy friendly™ by the Asthma and Allergy Foundation of America, AeraMax Professional also removes common triggers such as pet dander, pollen and mold spores. For Animal Care Clinic, installing AeraMax Professional has created a healthier, cleaner facility for pets and pet owners alike.